Here is the flag of Sklené, Pardubice region (Svitavy district) in Czechia. It was approved 5 October 2004 and published in Petr Exner's Vexillological Lexicon of Czech municipal flags 2004. Description: red, with three white, hoisttriangles, each charged with a red flower; in center a yellow glass chalice, flanked by a white key, bit down, and a white sword, pointing downwards. Sklené was formerly part of Sudetenland (kreis Zwittau = Svitavy) and named Glaselsdorf. 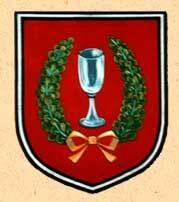 At this webpage is the old coat of arms: gules a chalice of natural colors with two branches vert connected below by a ribbon or. I assume it is now different, but the (canting) glass stayed.